NewsCast pulls in stories from around the web and then uses text-to-speech tech to fill users in. Microsoft is quietly testing an app that seems designed for people who feel overwhelmed by the media’s endless stream of news stories and who wish they had a helper app that reads them article summaries. The app, called NewsCast, hasn’t been formally announced, but it was first spotted by Neowin’s Brad Sams. It takes in articles from around the web and starts reading summaries of them to users in an ongoing playlist. Users can save articles for reading later and view the full text of any article NewsCast pulls in using a built-in browser or a distraction-free reading view. It’s all designed to keep users up to date on the latest news while they’re commuting and don’t want to be staring at tiny text on their phone. 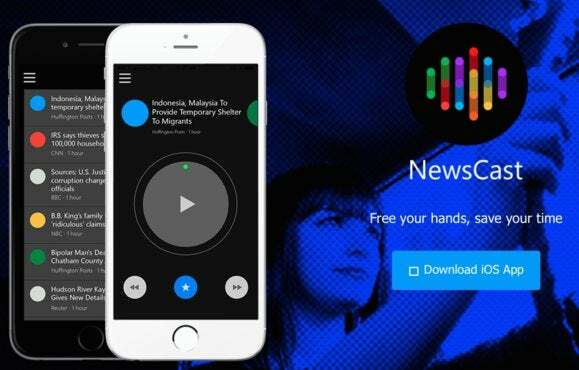 According to a publicly-accessible webpage for the app, NewsCast is a proof-of-concept product from the Bing News and Speech teams and seems to only be built for testing inside Microsoft. The teams are “trying to validate several hypothesis[sic]” with the app, though it’s not clear what they’re testing. Collecting feedback from users is a major focus of NewsCast’s current build—tapping a feedback button in the app opens an email that includes a three-question survey about what users like, dislike and want from it in the future. Interestingly, NewsCast is only available for iOS right now, which means that there must be a sufficiently large group of people inside Microsoft who use iPhones to be valuable for testing a new app. This isn’t the first time the company has built something specifically for Apple’s mobile platform before its own, however—multiple teams working on projects as part of Microsoft’s Garage idea lab recently released iOS-only apps. For now, anyone can download the app from this website and install it on an iPhone, though it’s not clear how long it will be before Microsoft takes it down. Because it’s not being sent through the App Store, users will have to give it permission to run on their device. Microsoft isn’t the only tech company going after mobile news summaries. Facebook is reportedly testing its own Twitter-like news app, and Yahoo has received accolades for its News Digest app, which gives users bite-sized summaries about current events. And of course, Apple’s own curated News app debuts with iOS 9 this fall.